A survey of forty years of artwork, Excelsior! 1975-2015 is a testament to working in the ‘wilderness’. The paintings of Dave Gordon are idiosyncratic, humorous and above all display a perceptive eye to out surroundings: woodpiles outside a cabin, figures metaphorically “lost” in the wilderness and farcical political portraits—including many provincial and national politicians. Especially incisive are a series of works produced during the bitter Mike Harris years (those aforementioned “lost years”), a perverse take on the Group of Seven, and a recent body of work documenting Gordon’s travels to Syria. In rejecting the spurious intellectualism of Conceptual art, Gordon found a way to document the local in a very personal manner. The works are simultaneously pastoral and political, finding solace in the landscape. Dave Gordon was born in London, Ontario and has been active in artist-run activities since the early 1970s. When the 20/20 Gallery closed in 1970, he and Jamelie Hassan founded the Polyglot Gallery in a local bookstore, and both helped establish the Forest City Gallery. In the mid 1970s, Gordon relocated from London to Kingston and in this new setting helped establish the Kingston Artists’ Association, Inc. / Modern Fuel Artist-run Centre in 1977; his support for artists’ rights and artistic responsibility have been wide acknowledged, often overshadowing his artistic practice which continues to develop in compelling ways. Dave Gordon’s work is in the collections of the National Gallery of Canada, Museum London, the Art Gallery of Ontario, the Canada Council Art Bank, The MacIntosh Gallery, Agnes Etherington Art Centre – Queens University, and numerous private collections across Canada. He has participated in the International Print Exhibition at the Taller Cultural Centre in Santiago de Cuba in 2012, and the exhibition subsequently traveled to Havana and four Canadian venues. Generously supported by Shannon Passero, Excelsior! 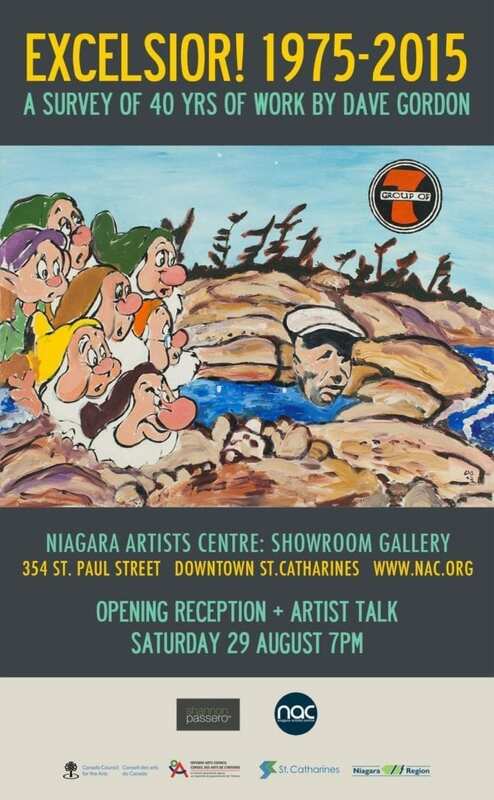 1975-2015 will also travel to Niagara Artists’ Centre (St. Catharines) and Forest City Gallery (London).